Buy tickets between Belfast & London or any station in Britain at www.loco2.com. No booking fees, no card fees. Booking opens 9-12 weeks ahead but you can even buy cheap tickets at short notice. For Belfast, select 'Belfast Port NI' for travel via Cairnryan or Birkenhead, or 'Belfast Central' for journeys via Dublin & Holyhead. For London, select 'London (Any)'. It'll also sell tickets to or from Derry, Coleraine, Newry & more. Set departure time to (say) 07:00 to see all morning departures from London & the South to Belfast. To specify a particular route, click 'More options' & enter Cairnryan or Holyhead or Birkenhead 12 Quays in the 'Go via' box. Ticket delivery: You collect tickets free of charge at any main British station including London Euston. Important: Tickets cannot be collected in Belfast or sent by post, they must be collected in Britain. If you want tickets sent to an address in Britain or Northern Ireland for £2 or to any address worldwide for £7.50, book at www.virgintrains.co.uk instead. Overseas credit cards welcome. If you're booking from the USA, Canada, Australia etc. You will understand the routes & fares better if you take the time to read this & this first! Collecting your ticket: You collect your tickets from these machines at London Euston or any main British station (the machine type may vary, and there are no machines in Northern Ireland). Just use the touch screen to click 'collect tickets' then insert your credit card, enter booking reference and out come the tickets. Alternatively, tickets can be sent to any address worldwide. Sssshh, it's a secret! You can buy cheap train+ferry SailRail tickets between Belfast & any station in Britain, in either direction, via Cairnryan, Holyhead or Liverpool, see the route map below. It's the traditional way to go, through the countryside by train and across the Irish Sea by ferry, the environmentally-friendly alternative to a flight. Bring a bottle of wine with you on the train (try doing that on Ryanair), sit back with a good book & enjoy the ride. This page explains the routes, timetables, fares & how to buy tickets. Option 3: London to Belfast via Liverpool overnight! For a journey between any rail station in Britain and Belfast, in either direction, you can simply check times & prices at www.loco2.com - it'll work out the best route for you. For more details of the train & ferry times, prices & what the journey is like on each route, click on the links below. For a time-effective overnight journey between Belfast & London with comfortable cabin on the overnight Belfast-Liverpool Stena Line ferry, try the route via Liverpool shown here. London to Belfast for £58.50 (£64 if bought on the day of travel or when the cheaper tickets sell out). Take a morning train to Holyhead in Wales and the afternoon ferry to Dublin. Then take an evening Enterprise express from Dublin to Belfast. 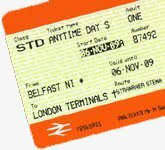 One ticket covers the whole journey from any station in Britain to Belfast or any station in Northern Ireland. Schedules, fares, how to buy tickets. 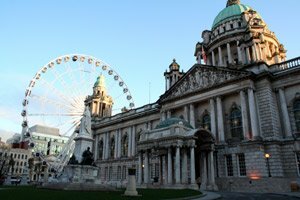 London to Belfast for £56, any day, any date, even bought on the day. This route takes about the same time as option 1 and is a similar price. Leave London on a morning train to Glasgow & change trains for Ayr then the Stena Line transfer bus to Cairnryan for the ferry to Belfast. 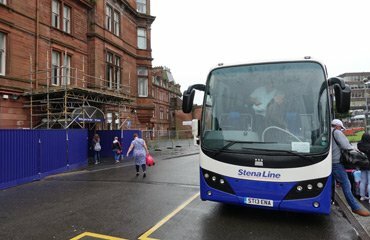 This route now involves a one-hour bus journey from Ayr to Stena Line's new port at Cairnryan rather than a direct train-ferry transfer at Stranraer, although overall journey time is slightly reduced. One ticket covers the whole journey, from any station in Britain to Belfast or any station in Northern Ireland. Schedules, fares, how to buy tickets. Option 3, London to Belfast via Liverpool - overnight in comfort! 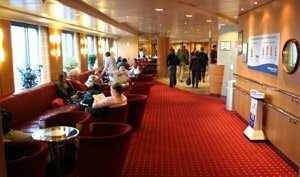 ...At Holyhead, you board the luxurious 50,000 ton ferry Ulysses for the sea crossing to Dublin. 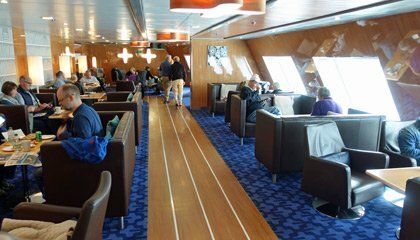 ...the Ulysses is perhaps the most luxurious ferry on the Irish Sea. The crossing takes 3h15, arriving Dublin Ferryport at 17:25. ...Transfer from Dublin Ferryport to Dublin Connolly station and board the 19:00 Enterprise Express to Belfast. Dublin to Belfast takes just 2 hours by train. 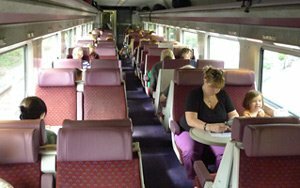 ...Spacious seating, a buffet car serving tea, coffee & hot meals, with great Irish scenery. You arrive Belfast Lanyon Place at 21:10. 4 countries in 1 day! Welcome to Belfast! No planes, no airports, no fuss. The route via Holyhead gives you the chance to see Dublin on the way, although if you want to stop off there for any more than an hour or two you'll need to buy separate London-Dublin and Dublin-Belfast tickets as you cannot break your journey on a SailRail ticket. The Holyhead route takes about the same time as the Cairnryan route, and costs about the same, so just see which timetable suits you best, this one or one via Cairnryan. By all means go out one way and back the other. 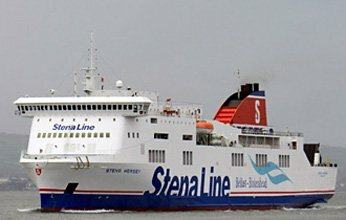 Step 1, travel from London to Dublin by train & ferry, leaving London Euston by train at 09:10 on Mondays-Saturdays or 08:15 Sundays for Holyhead, which connects with the 13:50 Stena Line sailing to Dublin arriving 17:05 or the 14:10 Irish Ferries sailing to Dublin port arriving at 17:25. For full details of this journey, see the Ireland page. Transfer by shuttle bus or taxi the 2 miles from Dublin Ferryport to Dublin Connolly station. Step 2, travel from Dublin to Belfast, leaving Dublin Connolly at 19:00 by air-conditioned Enterprise Express, arriving Belfast Lanyon Place (formerly known as Belfast Central) at 21:10. You can check times at www.irishrail.ie. If you like, you are entitled to a free transfer by regular local train between Belfast Lanyon Place and Belfast Great Victoria Street, which is often more convenient, it's next to the excellent Europa Hotel. London-Belfast costs £58.50 one-way if bought before 18:00 the day before travel, including trains & ferry (but not the bus transfer in Dublin, €3). This fare doesn't change, it's always this price whether bought 90 days ahead or 1 day ahead. However, it is £64 if bought on the day of travel or if the £58.50 rate sells out. Book online at www.loco2.com with ticket collection at any main British station (but not in Belfast) or by phone or in person as shown below. If you want to stop off in Dublin, stopovers aren't allowed with these cheap through tickets, so simply buy a £43.50/£49 London-Dublin ticket (see the Ireland page for times, fares & online booking), then buy a separate Dublin-Belfast train ticket at the ticket office at Connolly station when you get to Dublin, see www.irishrail.ie for times & prices. There are other options available via this route, including an overnight London-Dublin service with morning train connection from Belfast. See the London to Ireland page for all London to Dublin options. Then see www.IrishRail.ie for Dublin-Belfast train times. Allow plenty of time in Dublin to make the connection. There are Enterprise expresses from Dublin Connolly station to Belfast every hour or two from around 07:00 to around 20:00, journey time 2 hours. Step 1, travel from Belfast Lanyon Place (formerly known as Belfast Central) to Dublin Connolly by Enterprise Express, on any evening train you like. Stay the night in Dublin. In fact, there's an overnight Dublin-London ferry+train service, but without any sleeping accommodation so it's not a great trip, but if you want to use it, it departs Dublin Ferryport at 20:55 and arrives London 08:36, see the timetable here. Step 2, next day travel from Dublin to London by ferry & train, leaving the Mortons Coaches stop in Westmoreland Street at 07:15 or using a taxi to connect with the luxurious Irish Ferries Ulysses leaving at 08:05 and arriving Holyhead at 11:30 or the 08:05 Stena Line sailing arriving Holyhead about the same time. A train connection will get you to London Euston station at 16:39 Mondays-Saturdays, 16:44 on Sundays. For full details of this journey, see the Ireland page. Belfast-London costs £58.50 one-way if bought before 18:00 the day before travel, including trains & ferry (but not the bus transfer in Dublin, €3). This fare doesn't change, it's always that price whether bought 90 days ahead or 1 day ahead. However, it is £64 if bought on the day of travel or when the £58.50 rate sells out. Book online at www.loco2.com or by phone or in person as shown below. Because of the overnight stop, you may need to book by phone as the online system may not be able to handle this. If you want to stop off in Dublin, stopovers aren't allowed with these cheap through tickets, so simply buy a normal Belfast-Dublin train ticket (see www.irishrail.ie) plus a £42.40 or £47.60 Dublin-London train+ferry ticket, see the Ireland page for times, fares & online booking. There are other options available via this route, including an overnight Dublin-London service with evening train connection from Belfast. 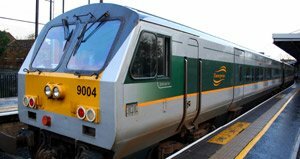 See the London to Ireland page for all Dublin to London options, then see www.IrishRail.ie for Dublin-Belfast train times. Allow plenty of time in Dublin to make connections. There are Enterprise expresses from Belfast to Dublin every hour or two throughout the day, journey time 2 hours. See the Dublin to Belfast pictures & video below. Advance = SailRail Advance fare. This is usually what you pay if you book by 18:00 the day before travel. No refunds, but changes of date and time allowed for £10 fee in person at British stations. Only valid on the specific trains reserved. Single = SailRail Single fare. This is what you pay if you buy on the day of travel, but it's also what you pay if the cheaper Advance fare has sold out. Refundable, less £15-20 admin fee. Valid on any reasonable connecting train service, so more flexible than an Advance fare. Irish Ferries or Stena Line? These fares are routed via Irish Ferries. Tickets routed via Stena line used to be the same price but are now £1.50 more. Swift fast ferry: Fares using Irish Ferries' Swift fast ferry instead of the ship Ulysses cost £5.50 more. Remember that the fast ferry can be cancelled in poor weather, the Ulysses is all-weather reliable. Transfer bus in Dublin: The bus from Dublin Ferryport to Dublin Connolly isn't included. This costs €2.50 (€1.25 for children under 16), paid on the bus. Please have the exact fare. Return journeys: A return journey = two one-way fares. Can I stop off in Dublin? Stopovers are not allowed with cheap SailRail tickets. But no problem, simply buy a SailRail ticket between London & Dublin using the advice on the London to Dublin page. Then buy a separate ticket between Dublin & Belfast either cheaply online in advance at www.IrishRail.ie or at the regular price at Connolly Station in Dublin. Children: Children aged 5 to 15 travel at 50% of the fares shown above. children under 16 must be accompanied by an adult. Unaccompanied children 16-17 years old must have written authority to travel from their parent or guardian. Taking a bicycle? Bicycles go for £9 each way on Irish Ferries, £10 on Stena Line. Pre-booking is recommended for Irish Ferries, email them at info@irishferries.com for details. Bikes are carried free on trains to Holyhead, but a bike reservation is compulsory on Virgin Trains as there's a 3-bike limit and recommended for Arriva Trains Wales who have a 2-bike limit. Dogs & cats: Dogs & cats go free on the trains. Irish Ferries & Stena Line allow foot passengers to take small dogs or cats if they're in a container which you can carry onto the ferry. The dogs or cats must travel in their container on the car deck or in the kennel area, see www.irishferries.com or www.stenaline.co.uk/faqs for details. Guide dogs can be taken into the passengers areas, other dogs cannot. Better value than flying: When comparing with the cost of a flight, remember that it will cost at least £15 one-way or £30 return for the train ride from central London to or from Heathrow, Luton, Stansted or Gatwick airports, in addition to the cost of the flight. And remember the airline baggage fees, check-in fees, and so on... And these SailRail fares are available at short notice and peak times, too, when flights are expensive! Railcards: As they are so cheap anyway, there's no further discount for young person's or senior railcard holders. Londonderry/Derry: There are also SailRail fares to/from Londonderry, which include the Belfast to Londonderry train. You can check these fares at www.loco2.com. Which British station is in which zone? You can buy a train+ferry ticket from any mainland UK railway station to Belfast, Londonderry, or any Northern Irish railway station via Holyhead. Lancashire, West Yorkshire, South Yorkshire, Derbyshire, Nottinghamshire, Leicestershire, West Midlands, Warwickshire, Northamptonshire, Hereford & Worcester, Gloucestershire, Powys, Gwynedd South. Cumbria, North Yorkshire, Humberside, Lincolnshire, Cambridgeshire, Bedfordshire, Buckinghamshire, Hertfordshire, Berkshire, Oxfordshire, Wiltshire, Avon, Gwent, South Glamorgan, Mid Glamorgan, West Glamorgan, Dyfed, Somerset. London, anywhere in Scotland, Tyne & Wear, Durham, Cleveland, Northumberland, Greater London, Surrey, Norfolk, Suffolk, Essex, Kent, East Sussex, West Sussex, Hampshire, Dorset, Somerset, Devon, Cornwall. Option 1, buy online at www.loco2.com. It sells tickets between any station in Britain & Belfast in either direction. Use Belfast Any Station to see routes via both Glasgow/Cairnryan and Holyhead/Dublin. Tickets can be collected free of charge at any main station in Britain including London Euston, but they cannot be collected in Belfast or sent by post. You must collect from a British station if you book this way. Tip: By default, the system normally routes you via Stena Line. 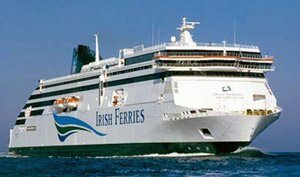 To travel via Irish Ferries superb ship Ulysses instead, click More options, select Go via and enter Dublin Port (Irish Ferries). 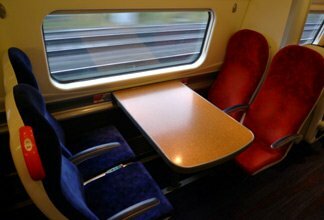 Option 2, buy online at www.virgintrains.co.uk. Same prices, no booking fee or credit card fee, as well as collection from any main British station free of charge, tickets can be sent to any UK address including Northern Ireland for a small fee, or sent to any address worldwide for a £7.50 fee. 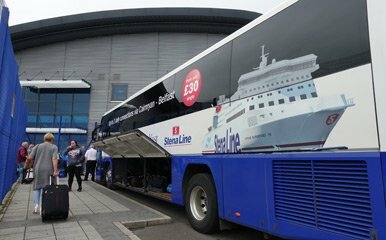 Option 3, buy online at www.stenaline.co.uk. You can also book tickets from Glasgow, Edinburgh, Ayr and a few other Scottish stations to Belfast at www.stenaline.co.uk. However, tickets can only be sent to UK addresses, they cannot be collected at stations, and the Stena Line system will only sell tickets from a few Scottish stations to Belfast, not from London and other British stations. You can buy in person at most British railway stations including London Euston, and in Belfast at the Northern Ireland Railways Travel centre at Great Victoria Street station, open 09:00-17:00 Monday-Friday, 09:00-12:30 Saturday. You can buy by phone, 08709 000 773. Lines open 08:00-20:00 Mondays-Fridays, 0900-1700 Saturdays & Sundays. 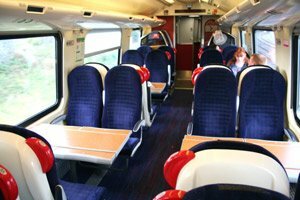 Or you can call Virgin Trains on 0845 7 222 333 Tickets can be posted to any UK address or you can ask to pick them up on departure from many UK railway stations, including London Euston. Or call Stena Line on 08445 762 762. Lines are open 08:30-20:00 Mondays-Fridays, 09:00-18:00 Saturdays & 09:00-17:00 on Sundays. To buy by phone in the republic of Ireland call (01) 703 1884 or e-mail europeanrail@irishrail.ie. How to read these timetables... Each column is a service you can take, and you read downwards. You change trains at each of the grey bars. You take a 125 mph Virgin Trains Pendolino train from London to Glasgow. 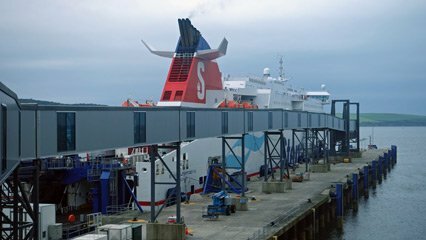 In November 2011, Stena Line stopped using Stranraer and switched to Cairnryan, so you now need to take a train from Glasgow to Ayr, then a special Stena Line connecting coach from Ayr to Cairnryan to connect with the Cairnryan-Belfast ferry. Times may vary on Saturdays & Sundays due to engineering work, so always check train & ferry times for your date of travel using www.loco2.com or www.nationalrail.co.uk. Belfast Port Stena Line terminal is at the far end of West Bank Road, see map showing Stena Line terminal. A taxi from central Belfast costs around £10. Translink's Metro 96 bus links Belfast Upper Queen Street with the Westbank Road Stena Line terminal for £2.00, see www.translink.co.uk click 'Routes & timetables', 'Metro' and search for Metro 96. The bus is connects with most ferry arrivals and departures, but not the 07:30 departure on Sundays, so you'll need a taxi for that. 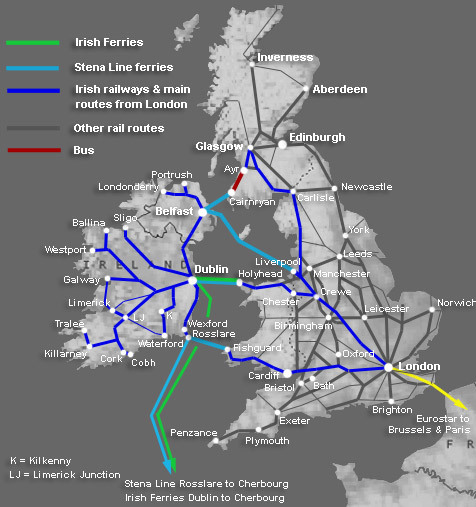 Note that Stena Line has two terminals in Belfast, one for Cairnryan and one for Liverpool, the Cairnryan terminal is slightly further from Belfast city centre than the Liverpool one. Edinburgh to Belfast? 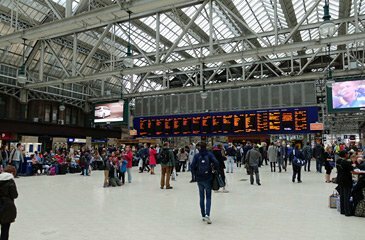 Edinburgh to Glasgow takes 51 minutes with a train every 15 minutes, then use the Glasgow-Belfast timetable here. 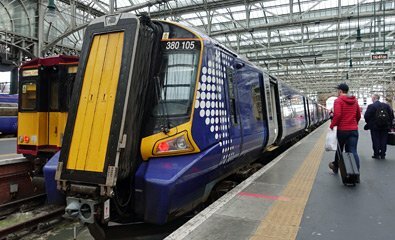 Simply book Edinburgh - Belfast Port at www.loco2.com. * = sleeper service, see the Caledonian Sleeper page. From any other station in Britain to or from Belfast, simply use www.loco2.com to find train+ferry times for your date of travel. The Glasgow-Cairnryan-Belfast timetable is also shown on the Stena Line website at www.stenaline.co.uk, select Rail & Sail and use the journey planner. These fares are Advance fares = You must book by 18:00 the day before travel, only valid on the specific trains booked. There are only Advance fares on this route now. 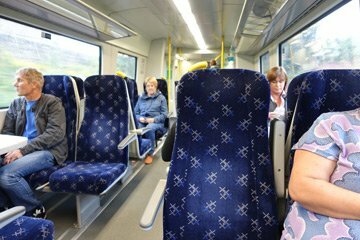 From Edinburgh, Glasgow & some other stations you can also find flexible Anytime fares which can be bought on the day of travel. They're the same price as these Advance fares. Return fares are simply two one-ways. You can check fares at the Stena Line website by selecting Rail & Sail and then using the journey planner. Which station is in which zone? Any station in Lancashire, Greater Manchester, Merseyside. Any station in Yorkshire, Humberside, Shropshire, Staffordshire, Cheshire. Any station in Greater London, Hertfordshire, Cambridgeshire, Oxfordshire, Buckinghamshire, Berkshire, Bedfordshire, Wiltshire, Avon, Hampshire, Sussex, Kent, Norfolk, Suffolk, Essex, South Wales. Any station in Cornwall, Devon, Somerset, Dorset. Senior or young persons railcard holders get a 34% discount on these fares. No discount with family railcard. Children aged 5 to 15 travel at 50% of the fare. Children under 5 go free, no ticket necessary. Going beyond Belfast? You can buy a through ticket from stations in the north of England or Scotland to any station in Northern Ireland, for example Antrim or Londonderry, just add £7 each way to the standard fare to Belfast. However, from London, East Anglia, the South and Southwest you'll need to re-book at Belfast. If the online system fails to book this (as it sometimes does), book to Belfast and buy an onward ticket when you get there. You cannot stop off with a SailRail ticket, except as necessary to make connections. If you want to stop off, you'll need to buy separate tickets for each stage. Remember, these fares are centre to centre, not airport to airport. When comparing, add at least £15 one-way or £30 return to the cost of the flight to cover the train ride from London to Heathrow, Luton, Stansted or Gatwick airports, plus baggage fees, airport taxes and more! Buy online at www.loco2.com, a very pleasant website to use, with no booking fee or credit card fees. It sells SailRail tickets between any station in Britain and any station in Ireland. International credit cards accepted. 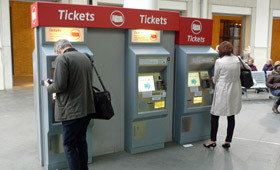 Tickets can be collected from the self-service machines at all main stations in Britain including London Euston, but they cannot be collected in Ireland or sent by post. Select Belfast Port N.I. for Belfast. It can help to click More options and enter Cairnryan in the Go via box if you specifically want just the route via Cairnryan. 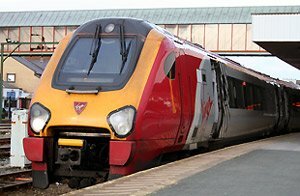 You can also buy at www.virgintrains.co.uk, much the same as Loco2, but tickets can be posted to any UK address for a small fee or sent to any address worldwide for a £7.50 fee. They can be collected at most main British stations, but cannot be collected in Belfast. You can also buy tickets from key stations in Scotland to Belfast online at the Stena Line website, www.stenaline.co.uk (tickets posted to UK addresses only, no collection option). Buy by phone, call 08709 000 773. Lines are open 08:00-20:00 Mondays-Fridays, 0900-1700 Saturdays & Sundays. Buy in person in Britain at most British railway stations, including the main ticket office at London's Euston Station. 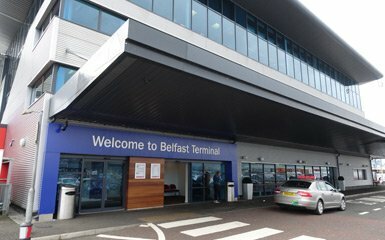 Buy in person in Northern Ireland, at the NIR Travel centre at Great Victoria Street rail station, open 09:00-17:00 Monday-Friday, 09:00-12:30 Saturday, or you can buy in advance or on the day of travel at the Stena Line ferry terminal in Belfast, look for the 'travel centre' counter as you walk in. 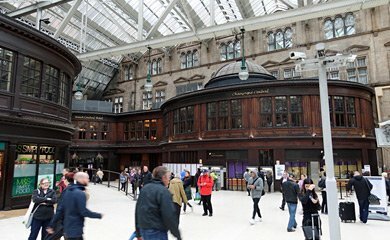 Glasgow's beautifully restored Central Station. The best place for a beer between trains is in Champagne Central (above right) on the 1st floor of the Grand Central Hotel. ...where the train is met by the Stena Line transfer bus to the ferry terminal at Cairnryan. The bus follows the scenic coast road for much of the way. 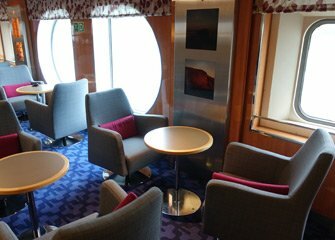 Stena Line offer a time-effective overnight ferry from Liverpool (in fact, Birkenhead) to Belfast with comfy en suite cabins making an eco-friendly business trip or weekend away feasible without the pain of the plane, see the photos below & watch the video guide here. There's also a leisurely daytime service. Leave Belfast by ferry after 10pm in a private en suite cabin arriving Liverpool 06:30, arrive by train in Manchester 9am, London or Birmingham 10am. Leave London after 5pm, Birmingham, Manchester or Leeds after 6pm, sail from Liverpool after 10pm, sleep in a private en suite cabin, arrive Belfast 06:30. If you're coming from Manchester, Birmingham, Leeds or anywhere else, simply look up train times to Birkenhead Hamilton Square at www.nationalrail.co.uk, with an arrival at least 90 minutes or so before the ferry sails. You can double-check ferry times at www.stenaline.co.uk. Train times are guides only, even the ones shown on the Stena Line site are a guide only, always check them for your date of travel at www.loco2.com or www.virgintrains.co.uk. You usually need to change at Liverpool Lime Street for Birkenhead Hamilton Square. 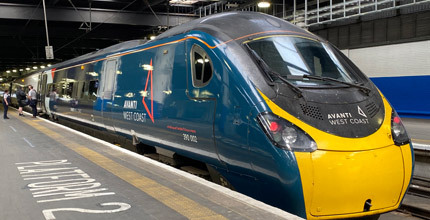 SailRail tickets are valid on any suitable connecting train, so feel free to travel earlier than the recommended train if you like (for example, Stena Line suggests the 18:33 from London on Tuesdays-Saturdays, but feel free to take the 17:33 instead). There are no SailRail tickets on this route now, so you buy separate tickets for the train and ferry. London to Liverpool by train starts at €17.50 each way if you book ahead, only good for the specific train you book. Liverpool to Belfast by ferry costs from £30 by day boat or £45 by night boat, each way per person, check fares at www.stenaline.co.uk. Cabins are optional, but typically cost around £55 per cabin for a 4-bed inside cabin with shower, toilet & free WiFi, rising to £85 for a Comfort Class outside cabin with shower, toilet, satellite TV, tea & coffee making facilities, complimentary fruit bowl & soft drinks, free WiFi. 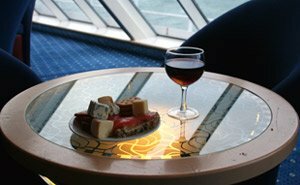 On the day boat, treat yourself to the privacy of a cabin with shower & toilet at a reduced rate from £20 per cabin, or to the Stena Plus lounge with complimentary tea, coffee, snacks & red or white wine for £25 extra. Step 1, book the ferry online with a comfy cabin at www.stenaline.co.uk, or call Stena Line on 08445 762 762, lines open 08:30-20:00 Mondays-Fridays, 09:00-18:00 Saturdays, 09:00-17:00 Sundays. In the Republic of Ireland call 01 204 7744. You travel by train to Liverpool Lime Street Station. From London, this is a smart Virgin Trains 125 mph pendolino taking a little over 2 hours with on-board shop selling tea, coffee, drinks and snacks. From Manchester or Leeds it's a smart air-conditioned Trans-Pennine Express. You can look up train times at www.nationalrail.co.uk. At Liverpool Lime Street, go downstairs to the MerseyRail platforms and hop on a MerseyRail train to Birkenhead Hamilton Square. There's a train every few minutes and it's just 3 stops. At Birkenhead Hamilton Square, take the lift to street level, exit the station and turn sharp left and you'll see the Stena Line bus stop on the corner. 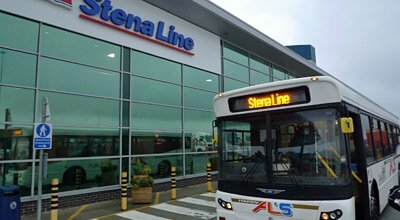 Stena Line run a courtesy bus from Birkenhead Hamilton Square railway station to their 12 Quays ferry terminal with departures on Tuesday-Sunday at 07:30, 08:15, 09:15 for the daytime ferry and at 19:30, 20:15, 21:15 for the overnight ferry. On Mondays the courtesy bus leaves at 19:30 & 20:15 for the overnight ferry. The bus ride take just 5 minutes. If you feel energetic, you can walk from Hamilton Square to the ferry terminal in 19 minutes, see map showing terminal and Lime Street station. Alternatively, you can take a taxi from Liverpool Lime Street rail station direct to the Stena Line 12 Quays ferry terminal in Birkenhead, journey time around 15 minutes, taxi fare around £15. At the ferry terminal you check in at the Stena Line desk and are given your boarding card and cabin key. The terminal building has vending machines toilets and free WiFi. When the ship is ready for boarding, a minibus shuttles you from the terminal building right onto the car-deck of the ferry from where an escalator takes you up into the passenger accommodation. If you have a cabin you can ask to keep your bags with you, but normally they ask you to check in your larger bags at the terminal building and pick them up again on the other side, leaving you free to use the ferry's restaurants, bars and cinema un-encumbered. You'll get great views of the Liver Building from the deck of the ferry as she sails from the Mersey. On arrival into Belfast, you'll see the famous Harland & Wolff cranes Samson and Goliath on the skyline as you sail up Belfast Lough. You disembark at the stern of the ship, taking the escalator from the passenger deck to the car deck, where you step on board a minibus which transfers you to the ferry terminal. If you have checked in your bags, you collect them here. A taxi from Belfast Stena Line terminal to any hotel in central Belfast costs around £9, and takes less than 10 minutes. There may be taxis waiting, if not there's a taxi freephone at the terminal. A taxi from a hotel in central Belfast to the Stena Line VT2 terminal costs around £9 and takes less than 10 minutes. 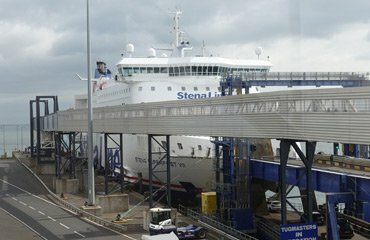 Note that Stena Line has two terminals in Belfast, one for Cairnryan and one for Liverpool. The Liverpool terminal is slightly closer to Belfast city centre than the Cairnryan one. Check-in for the overnight ferry opens at 20:00 Tues-Sat, 19:30 Mondays, with boarding from 21:00 Tues-Sat or 20:30 Mondays, giving you plenty of time to settle into your cabin. Check-in closes at 21:30 Tues-Sat, 21:00 on Mondays. For the day crossing, check-in opens 08:00 and closes at 09:30. 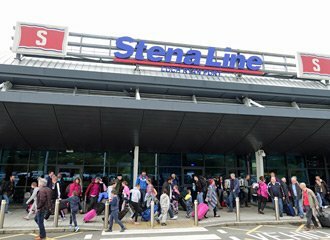 The Stena Line terminal building has vending machines, toilets and free WiFi while you wait to board. 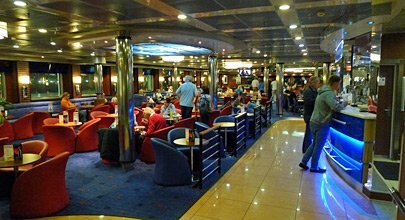 When the ship is ready for boarding, a minibus transfers you from the terminal building straight onto the car deck of the ferry, you step off the bus at the foot of an escalator at the stern of the ship which takes you up onto the ferry's passenger deck. If you have a cabin you can ask to keep your bags with you, but otherwise you can check them in by placing them on a luggage trolley at the terminal building and picking them up again at Birkenhead, leaving you free to use the ferry's restaurants, bars and cinema un-encumbered. You sail out of Belfast Lough with the two giant Harland & Wolff cranes disappearing astern on the skyline. As the ferry arrives in Liverpool, watch for great views of the Liver Building across the Mersey. When disembarkation is announced, foot passengers descend the escalator at the ship's stern and board a minibus on the car deck which transfers them to the terminal building. If you have checked in your bags, you collect them here. The night boat docks in Birkenhead at 06:30, you'll be at the terminal building by 06:45. A courtesy bus leaves from the front of the terminal at 07:00 or when all foot passengers are on board, then it's a 5-minute drive to Birkenhead Hamilton Square station. The courtesy bus is included in your SailRail ticket. Cross the road, enter the station and descend to the platforms by lift. Hop on the next train to Liverpool, they run every few minutes and are usually shown as going to Liverpool Central. This train is included in your SailRail ticket. Get off at Lime Street, just 3 stops and take the escalators to Liverpool Lime Street mainline station above ground. Alternatively, you can take Taxi direct from the ferry terminal in Birkenhead to Liverpool Lime Street station, journey time around 15 minutes, taxi fare around £14. Travel from Liverpool Lime Street station to your final destination by train. If that's London, you travel on one of Virgin Trains' 125 mph air-conditioned Pendolinos, taking just over 2 hours to central London. You can look up train times at www.nationalrail.co.uk. 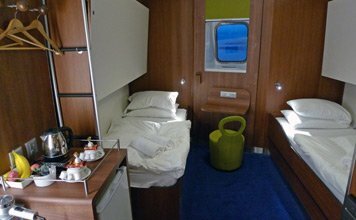 ...Comfort Class cabin with shower & toilet, satellite TV, free WiFi, tea/coffee facilities. 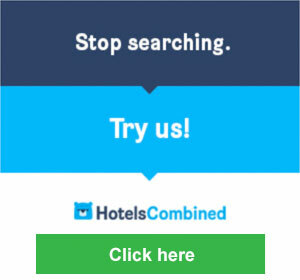 You can book hotels almost anywhere in Britain through www.hotelscombined.com, just use the search box below. 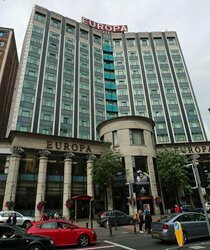 For comfort and location, stay at the Europa in Belfast. 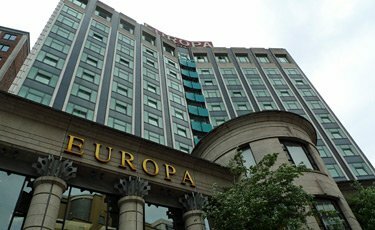 Opened in 1971, Belfast's famous Europa Hotel has more history than many hotels three times its age. 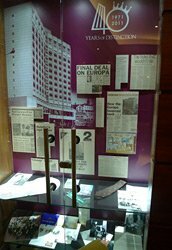 It was the hotel used by journalists such as Trevor MacDonald, Kate Adie, John Simpson during the Troubles in the 1970s and 80s, when it earned the title of Most Bombed Hotel in Europe. Indeed, it suffered so many bomb attacks and had so many windows boarded it up, it was also known as the Hardboard Hotel. Yet it stayed open in spite of everything, a true survivor. And today it's a fabulous place to stay, ideally located next to Great Victoria Street Station and across the road from the famous Crown Bar. You'll find a book about the history of the hotel in your room for you to read, and a display case on the first floor near the piano with some hotel memorabilia. There's also a railway connection, as it was built on the site of the Great Northern Railway terminus, the ancestor of today's Great Victoria Street station. The Moselle Suite, room 911. The history cabinet, first floor. 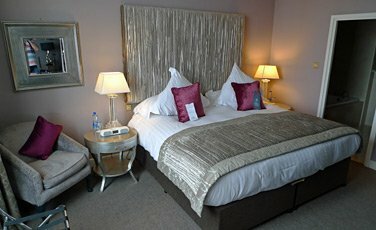 www.tripadvisor.com is a huge resource, a good place to browse independent travellers' reviews of all the main hotels in Belfast & NI. www.booking.com is my own preferred hotel booking system (Hotels Combined being a booking site comparison system). It has a simple interface, a good selection in most countries worldwide, useful online customer reviews of each hotel, and decent prices, usually shown inclusive of unavoidable extras such as taxes (a pet hate of mine is systems that show one price, then charge you another!). If you're on a tight budget, don't forget the hostels. 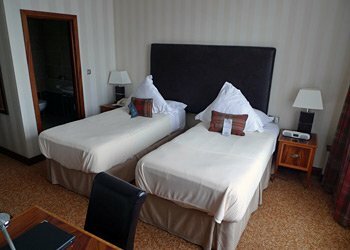 For a dorm bed or an ultra-cheap private room in backpacker hostels in Belfast and most European cities use www.hostelworld.com.